Although spelt flour can be challenging when used for yeasted baked goods, it works like a dream when used alone for pie crusts for both sweet pies and savory quiches. Even if you're not a fan of whole-grain piecrusts (which can sometimes be too thick, dry, and crumbly), please give this one a try. When made with a light hand, it is as tender and flaky - and much, much healthier - than boring old all-purpose flour white crusts. Put your mixing bowl and pastry blender in the freezer and allow them to chill, for at least 20 minutes. One of the secrets to producing a flaky crust, especially when using a high-protein flour like spelt, is to keep your ingredients as cold as possible. Use a balloon whisk to lightly sift together the spelt flour and the salt in your chilled mixing bowl. Coarsely cut the butter pieces into the flour using a pastry blender or two knives, until the particles of the mixture are the size of small lentils. Use a fork to add the ice water, a tablespoon at a time, just until the dough begins to pull together into a mass. 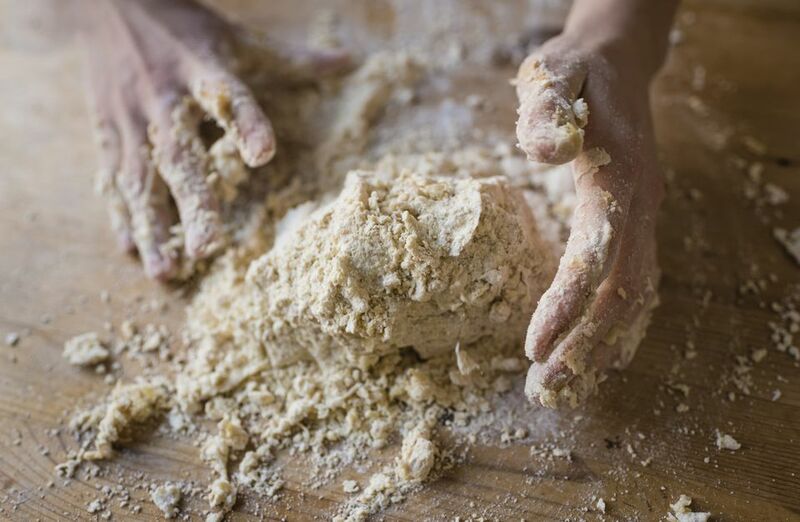 Transfer the shortcrust pastry to a lightly floured counter and very lightly knead it over upon itself three times. Return to the mixing bowl and refrigerate for at least 30 minutes to allow the dough to rest.